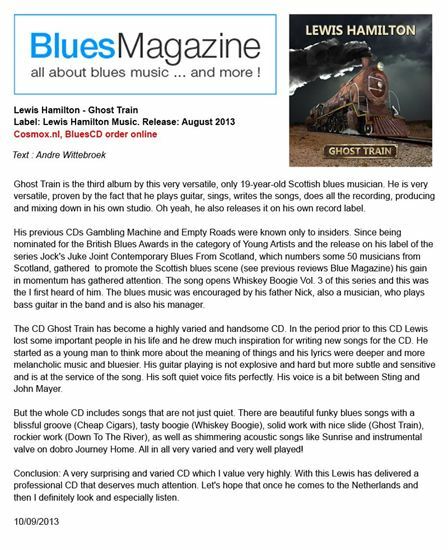 "Lewis Hamilton is a 19 year old from Scotland, but he has already released two solo albums before Ghost Train, as well as compiling and releasing a highly-regarded three volume series of Scottish Blues, Jock’s Juke Joint, which featured both Hamilton’s own songs and those of 50 other contemporary Scottish blues artists. He sings, he plays guitar, he writes the songs and he produces the music. If only all 19 year olds had a similar work ethic. And the good news is that all that work is paying off. 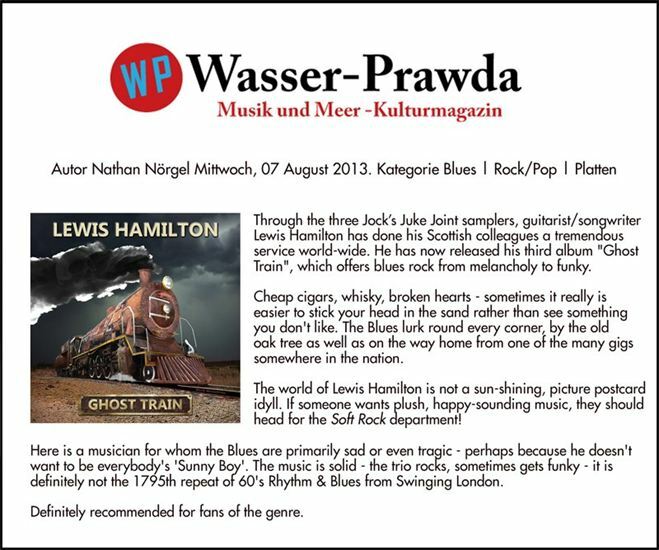 Ghost Train is an impressive and enjoyable slice of traditional blues rock. Despite (or perhaps as a direct result of) Hamilton’s relative youth, there is a distinctly retro feel to Ghost Train. Other than the modern production values, many of the songs could have come straight out of the 1970s or early 1980s. There is even a hint of disco in the funky guitars in “Trust In Me”. 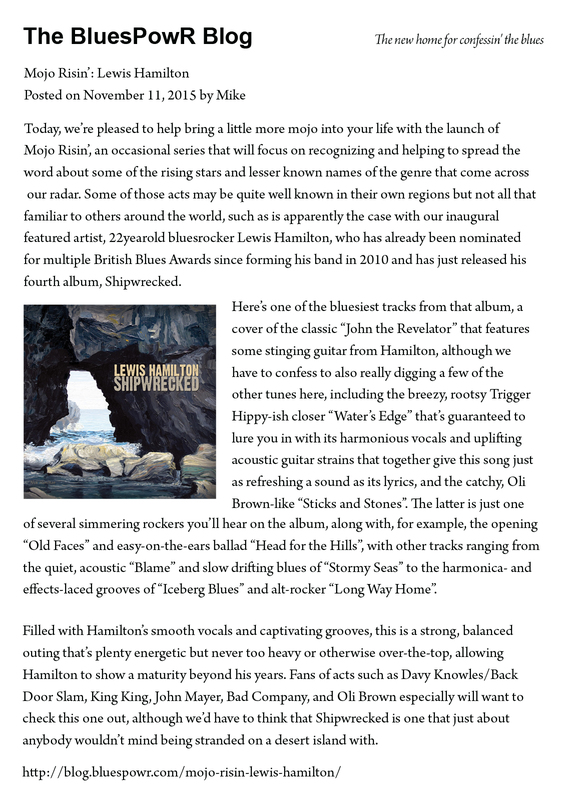 Primarily, however, from the opener “Lonesome and Blue” with its overdriven guitar riff around which the vocals fit, to the arpeggios of “By The Old Oak Tree”, this is guitar-driven blues-rock. The retro theme even extends to the cover art photographs, which depict Hamilton walking into an apparently deserted railway station with a guitar in his hand, and then sitting on the platform, presumably waiting for his Ghost Train to come in. In both photos, a cigarette dangles from his mouth, even though smoking in public places has been illegal in Scotland since 2006. 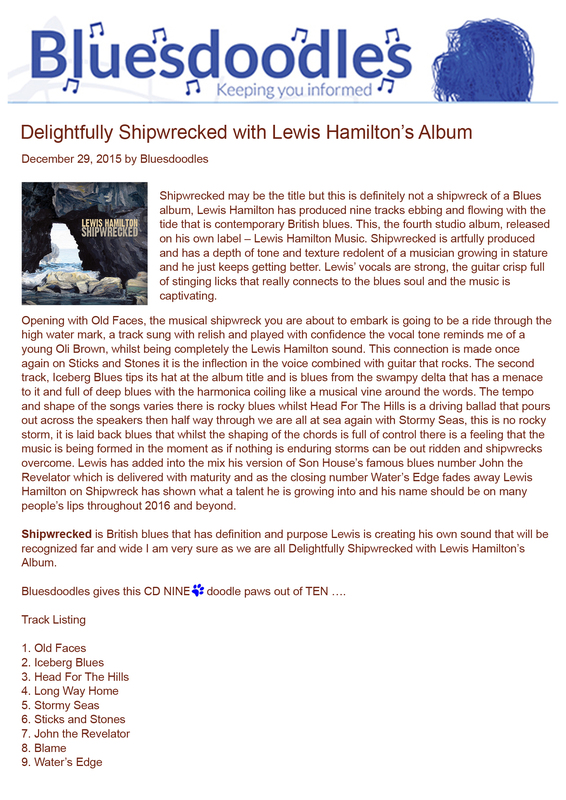 Lyrically, Hamilton also demonstrates enthusiasm for all those things we are meant to frown on in the modern world, as titles such as “Cheap Cigars” and “Whiskey Boogie” might suggest. 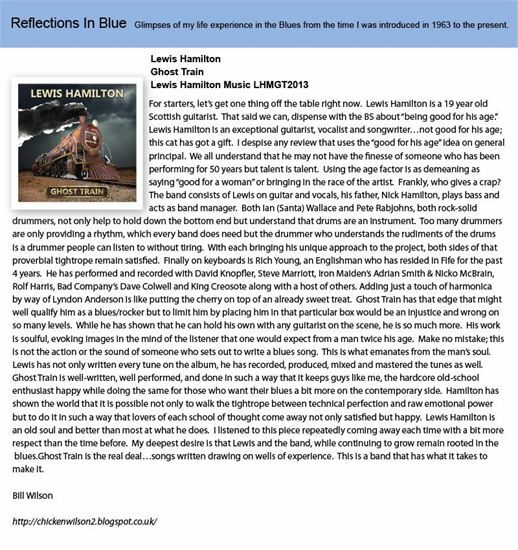 Although Hamilton himself is the primary point of focus on the album, fine and supple support is provided by Nick Hamilton on bass and Ian (Santa) Wallace or Pete Rabjohns on drums. 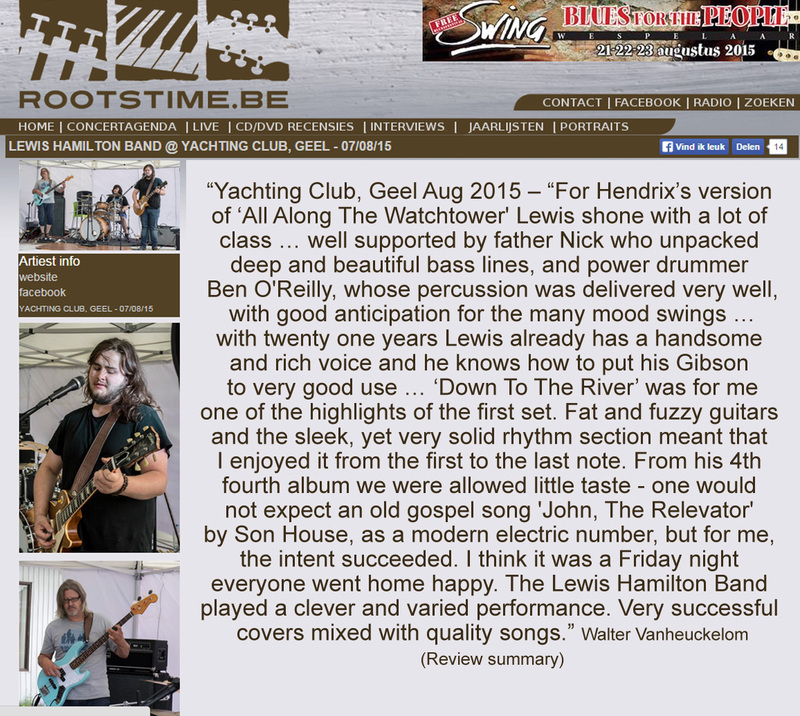 Rich Young also adds Hammond organ or keyboards on four songs. Lyndon Anderson adds harp on one song (“Whiskey Boogie”) and Bruce Michie adds trumpet and sax on “By The Old Oak Tree”. The album was recorded and produced by Hamilton at Sawmill Cottage Studios in Auchterarder, Scotland and benefits from a warm sound quality. He is an impressive guitar player, switching from electric to acoustic to slide with equal dexterity and he turns in some beautifully melodic solos. He also has a warm, smoky singing voice, although as with many lead guitarists who also sing, the voice often takes second place to the guitar. 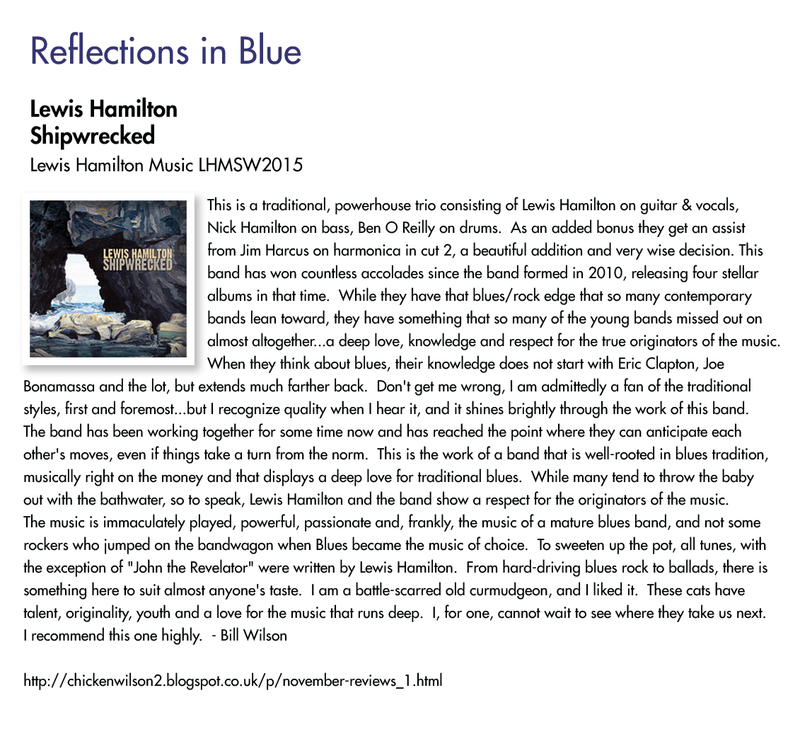 There are definite hints at various points in the album of the influence of Stevie Ray Vaughan (on “Breaking Heart” especially), but Hamilton is also finding his own voice. The acoustic “Sunrise” is one of the highlights of the album, featuring a couple of over-dubbed acoustic guitars and providing perfect melodic support to Hamilton’s weary voice as he sings “Oh, alcohol, you caused it all. That don’t mean my feelings ain’t true. Oh, sleepless nights, I held you tight. Let me feel the way that I do. When I see the sunrise, don’t be surprised, if I show some pain, when you push me away, once again.” Equally impressive is the closer “Journey Home”, an acoustic instrumental with Hamilton accompanying his own melodic resonator guitar playing with a gently strummed acoustic rhythm. Lewis Hamilton is clearly on an upwards trajectory. 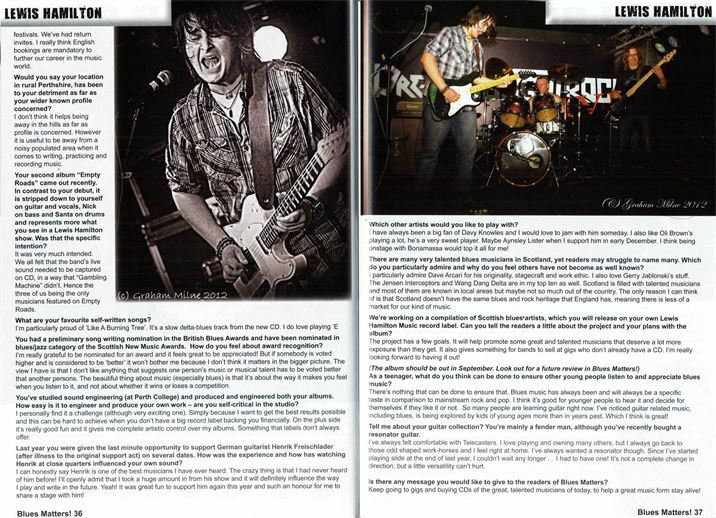 One of his previous albums, Gambling Machine won the Best Jazz/Blues Recording category at the 2012 Scottish New Music Awards, while “I Got To Know” from the same album won a preliminary nomination in the British Blues Awards song writing category. Ghost Train is another step in the right direction. Expect Hamilton to go onto bigger things. He clearly has all the talent necessary. Let’s hope he gets the breaks too." "This new album from this Scottish prodigy has a lot to live up to. The first albums were quite frankly, stunning so this one very much has a point to prove. The style is very much guitar driven blues, with some funk, jazz and soul infused. Of course there are some pure blues tracks too, as that’s what primarily what this album is all about, but it’s definitely not a one trick pony that’s for sure. The guitar work once again is exemplary and the vocals have an understated approach. Nothing is overdone and everything just comes together seamlessly, to make greater the sum of the parts. From the guitar playing, it’s easy to tell that there is considerable talent there, but also the knowhow to wield it to greatest effect. Not all guitar driven blues has to have ninety mile an hour solos, or overly exaggerated sustain, although I like that to by the way. This is an album that is good because it doesn’t go out of its way to show you how good it is. It just turns up, does the job, and then when it’s finished turns to look at you just in time to catch you saying “that’ll do”, or words to that effect. This is heartfelt soulful music, just as honest as the day is long in June, and when music has that much integrity, it just has to be good. One of the most important things about this album though is that it’s from one of the rising stars on the scene, and it’s albums like this that are keeping the scene alive. 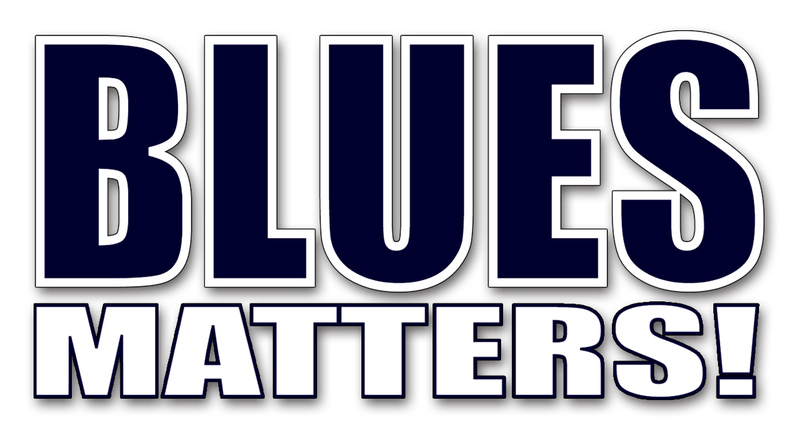 If the new generation of blues musicians keep churning out music of this quality, the blues scene is going to remain healthy for a very long time, and that is a good thing, a very good thing indeed." "First chance of the year to catch up with my other "hot-tip" from last year, Lewis and his Boogie Brothers. This has to be one of the most "sorted" of the new wave of Scottish Blues acts. Certainly one of the best, young slide guitarists I've heard in a long while, and that's how he kicked off his set on Saturday, with a bit of Robert Johnson before being joined on stage by Nick and Santa and launching into his own Empty Roads: so into it, he didn't realise a string had gone mid-way though. Thing about Lewis, his sets just seem to roll out, yet he has a way about him that just carries an audience along for the ride, whether he powers through some classic ZZ Top or takes it down with some Mayer-styled Ray Charles' I Don't Need No Doctor; that's not to say Lewis' own material doesn't stand up along side; Drinking Game always gets feet going and a new track, Broken Heart already sounds a winner. Even in a shortened set, Lewis trawls the audience for suggestions; he's already has established such a connection, which a recent American visitor couldn't do. Lewis's also has two seasoned pairs of hands on stage with him, Nick on bass providing solid backing and the amazin' Santa pounding the skins and driving things along. Bit of an evening for Hendrix covers, with the Albany Down lads doing Voodoo Chile, Lewis served up a hot Purple Haze and All Along The Watchtower, which to be fair, is one of Dylan's. And that kind of wound things up; time seeming to pass very quickly; but that's how things are with Lewis, you get caught up in his enthusiasm and love of what he does; and then it hits you after, how bloody good he is at it. Check him out if he's round near you - he's getting a taste for English beer, so won't be far off. I see he already has Germany in his sights." 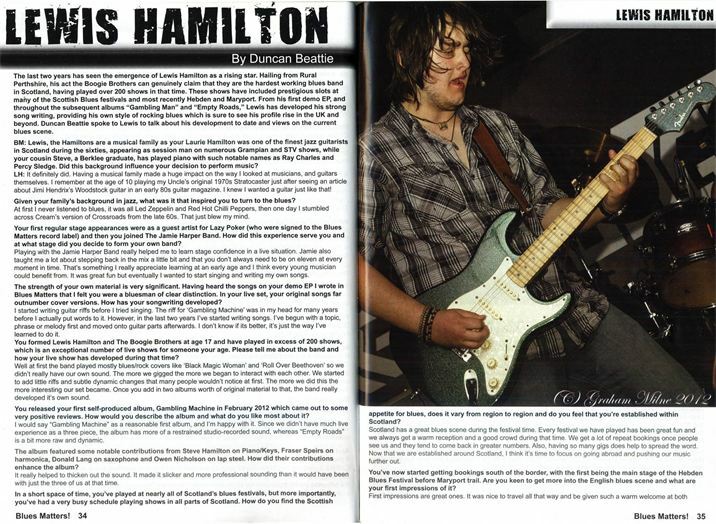 "I had to miss the last half-hour of Andy’s (Fairweather-Low) set to catch one act in particular, Lewis Hamilton & The Boogie Brothers; playing in The Quaker House on a rare excursion down from Scotland. This was a hot-tip I had to follow up, and I was not disappointed. 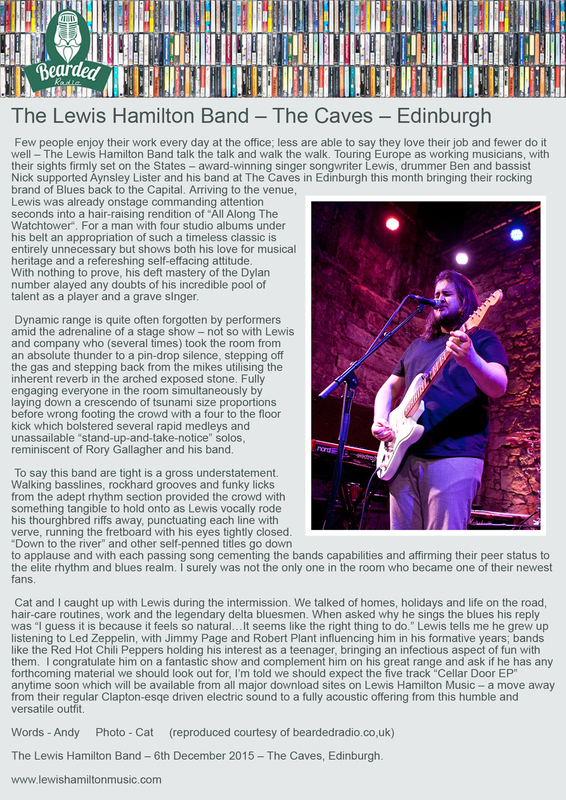 Still in his teens, Lewis’s fingers are made of rubber and magic as he throttled his way through a couple of Telecasters in a style I’d put somewhere between Rory Gallagher and Jeff Healey. Not only that, he has a fair ol’ set of pipes (his voice, not bagpipes) and a comfortable and confident stage presence that immediately engages with the audience. Hell, he insults our beer (“tastes like socks!”) and we laugh with him. Making the power-trio is Nick on Bass & Santa behind the drums – and these guys know their business, make no mistake. The set, split over two 45 minute sessions are an eclectic mix of self-penned and standards, with a couple of left-field covers to add character. Yes, you get your Hendrix and Freddie King, Deep Purple and Ray Charles freshen things up, but a rapid-fire Johnny Cash cover (Fulsom Prison Blues) comes in like a shot of Tabasco. And then we’re treated to an ad-hoc instrumental I’ll call Quaker House Strut. Somehow, I don’t think these guys will ever go hungry in these parts, not when the Quaker House is crammed full before the end of their 1st set."